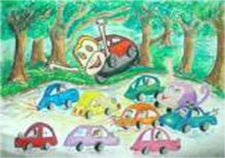 Dream car art contest is an international contest organized by Toyota for children to explore their imagination to draw the car of the future. More or less, it is indeed the only competition of its type held in Pakistan where children as well as parents can also know that today; cars are designed by Transportation, industrial and automotive designers, not by engineers. These children, although young but they certainly observe the problems around them and most of the entries made by Pakistani young guns were to solve their country’s problem with their creative imagination. It sorts of make me proud at the level of responsibility they have shown to solve the problems faced by Pakistanis. There were three age categories (1) under 10 years (2) 10-12 years (3) 13-15 years and 5 total prizes. Gold, Silver and Bronze winners will be invited to Japan for a special awards presentation ceremony. Fatima Noor, 12, took the first position with her artwork “Monkey Car” and also arrived in the international top 30 winner’s list becoming the only Pakistani to be representing her country amongst international winners. It doesn’t take a rocket scientist to see that Fatima made the monkey car which will move like a monkey with the help of trees to avoid traffic jams. Almost all the entries made by Pakistani children were flying cars to avoid traffic jams. Syed Ali Ishaq, 9, took the second position with his “Ice Cream Car”, I myself like the idea of having an ice cream car in this scorching days of summer, especially when electricity isn’t frequent in our homes. Ali saw our problems and gave us the proper and cool solution. Adeel Ahmed, 8, took the third position with his “Bird car”. I wonder what made him want to fly but the view he has presented is surely, enlightening. The rest of the entries are all followed at the end of this article, however, here are two other entries that shows how the war on terror and daily violence has left an impact on our children’s mind. Taha Farooq, 11, made this “Ambulance” with pretty tall legs to make sure, never again does anyone die in traffic jams. Muhammad Ali Abbasi, 13, drew the following drawing which he named “Green Peace”, even though I am not a psychologist but anyone can observe what made the kid so responsible at such a young age. The parents through such means can know what their children want to become, and it is their duty to make sure the children don’t let go of their imagination and dreams to pursue a career like a stereotype, especially when there’s a shortage of automotive designers in our country.